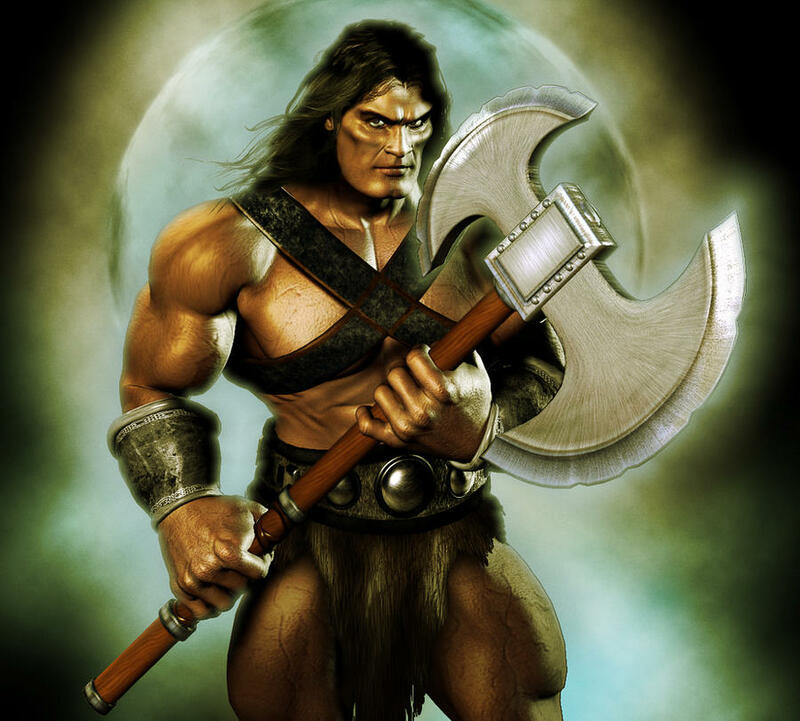 Note the huge axe, lack of a shirt, and manly chest. All of these are mandatory. Light Blue - Mantastic. Take this option or you will be a sissy girly man. Blue - Manlier than most. Usually a good option, but you may find something better. Black - Manverage. You won't be losing anything here, but you won't be gaining much either. Purple - Not optimal. You won't be busting down many doors if you take this option. Red - Oddly enough, the manliest color is reserved for the girliest options. Don't be a wuss. Last edited by NeoSeraphi; 2014-12-24 at 12:43 PM. 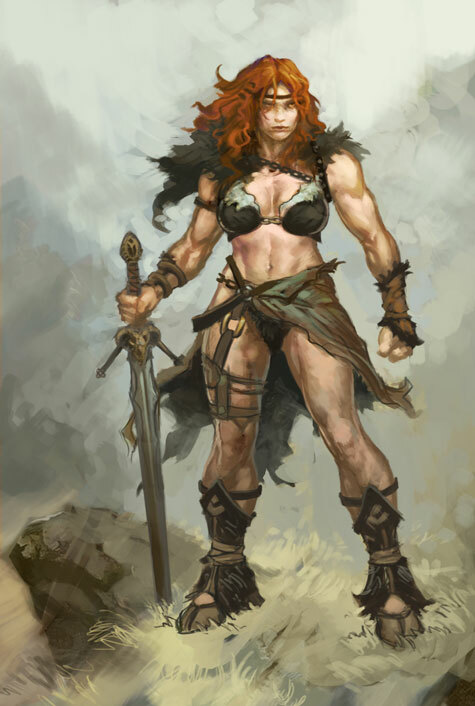 For some reason, most acceptable art of female barbarians includes them wearing some kind of fur or animal skinned bra, even though 75% of all actual in-game barbarians (either NPCs or players) will continue to wear nothing above the waist. Tank - A barbarian is a different kind of tank than a fighter or a paladin. Instead of tanking with lots of armor and Lay on Hands, barbarians tank with their buff, manly chests. With a d12 hit dice and the Bear Totem features, you will laugh off any damage coming your way. And unlike a fighter or a paladin, if the enemy tries to ignore you, you'll just kill them instead! Damage - A barbarian gets scaling bonus to their damage while they rage, as well as easy access to advantage on attack rolls and a capstone that literally lets them break the rules on capped stats. It doesn't matter. Rogues? Not as accurate. Fighters? Not as high damage. Paladins? Still not as fast as you in that bulky armor. Barbarians are the kings of melee damage in D&D. HD - You get the highest HD in the game. In fact, the d12 might as well have been created just for barbarians, since its only uses are the beastly greataxe and the barbarian HD. Skills and Tools - You get 2 skills from a small list, but Perception is on that list so what does it matter? Skills are so easy to pick up in this game anyway. You get two free ones from your background and more from your race. You get no tool proficiencies. Armor - You get proficiency with everything except heavy armor, so no sky blue here, but still better than average. Weapons - Everything. Go crazy. Saving Throws - Strength saves aren't that common, but when they do come up they're usually meant to get you away from something that you should be beating the crap out of, so it's nice that you get a bonus to avoid that. Con saves kill you, and if you're dead that cuts in to your face-smashing time, so make sure you roll high. Unarmored Defense: You get to use your chest as armor. Immensely flavorful, to the point that I wish it was a thing in 3.P so that I could have had it then too. It just seem so...core to the barbarian identity. It's not as good as full plate, obviously, but if you want to play a true, shirtless barbarian, you won't be gimped for doing so. Rage: This is why you play a barbarian. And somehow, even though it's lost the traditional ability score bonuses, rage has become even more manly. Advantage on Str saves and Str checks. You rage, you're going to break that door down and no wimpy monk is going to be pushing you back. You get a bonus to damage, which means that your damage will always be higher than someone else who has 20 Str. Very good. And you get resistance to physical damage. At level 1. This is ridiculous. Your chest will literally break arrows while you have to make an Int check to even notice you were attacked. Which you will fail, because you are a man. Rage does have a weird restriction now, but that isn't enough to push it below sky blue. Reckless Attack: Rogue/barbarian multiclass anyone? (A rogue has to use a finesse weapon to Sneak Attack, but they don't need to use the finesse quality if they don't want to, so you could use a dagger with your Strength and still Sneak Attack). Like I said, a barbarian tanks with his health, not his AC, so making sure people hit you (and then halving the damage you take) in order to make sure you hit them is ridiculous. This doesn't even take an action to use and as long as you're doing your job and dropping the enemies in one round you won't even feel the penalty. If your DM allows it, you can also use Reckless Attack to disarm your opponents more easily (by making an attack roll against the target's Athletics or Acrobatics check) and then using your object interaction to pick the item up and deny it to the enemy. Danger Sense: Dex saves are very common, and while you don't get proficiency with them, advantage on them is arguably better anyway. If you take the Resilient (Dexterity) feat this becomes sky blue. Extra Attack: You do more damage than a paladin, ranger or monk, and you still get the same number of attacks as them. Fast Movement: I'm honestly not sure what inspired this in the first place. To me, this should be part of a totem (lion possibly) if the intended flavor is that some barbarians try to emulate fast animals. It's a decent ability, to be sure, and you'll be glad for it most times, but generally DMs will build encounters around the standard move speed because the rest of your party will be slower, so you might not notice this. 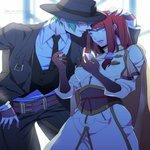 Feral Instinct: Advantage on initiative checks? That's amazing! And you get to act normally during surprise rounds when you're raging. Combined with Reckless Attack and Fast Movement, I really do have to wonder if WotC does want to see Barbarian/Assassin Rogue multiclasses. Someone get on that already. Brutal Critical: This is amazingly flavorful, and helps to emulate that original greataxe feel, but considering that it still only has a 5% chance of occurring it's not that useful in game. But when it does come up, you will feel more like a barbarian than you ever have. Relentless Rage: You can, by making a DC 10 Con save, literally keep fighting even when you would die. Considering that orcs are not a playable race and half-orcs can only do this once per long rest, this is basically the only way in the game to emulate that old school Ferocity ability. Not that it matters, since it's on the only class that needs it. Persistent Rage: It's certainly a welcome ability, but it's the removal of a restriction that was only added this edition, and if you play correctly you should never end your rage prematurely anyway (unless your DM is intending for that to happen). A decidedly meh ability at a level where you should really be feeling much manlier. Indomitable Might: Seriously, my friends and I can't read this ability without laughing out loud. If you roll less than 20 on a Strength check you can take 20 on that check instead. The best part is, of course, that you can still roll the dice first, so if you roll higher than 20, you keep that roll. Primal Champion: You get to have more Strength than anyone else at the table. Period. But what if - no. The capstone for barbarians literally lets them break the rules of capped stats. And gives them the 4 Str and Con on top of that. Mannificient. Frenzy - It's so disappointing. Such a great ability that is ruined by the system, not the ability itself. The problem here is that levels of exhaustion can only be removed one at a time by the greater restoration spell, which is only available to clerics and druids, costs 100 gp per cast, and consumes a 5th level spell slot (so you only get it at 9th level and onward). So in a game where you are expecting to run into 6 encounters a day at all levels, wearing yourself out is not something you want to do, ever. Mindless Rage: You become fearless and can't be swayed by charm when it matters most. You can also enter a rage to suppress any fear or charm that is currently on you. An excellent feature especially at the level it comes online. Intimidating Presence: Very flavorful, but it comes online a little late, and it scales off your Charisma, which is probably your fourth highest stat (Str>Con>Dex>Cha>Wis>Int). Retaliation: A beautiful capstone that rounds out an all around not so beautiful path. This is the only class feature a Path of the Berserker will have that uses his reaction, so there is nothing other than feats that prevents you from doing this and nothing else every round. Spirit Seeker: Who says a barbarian can't scout? The beast sense spell is amazing, and being able to cast it as a ritual without taking a feat is both flavorful and ridiculously useful. Speak with animals will more than likely also have its shining moments in any game. Honestly, the only problem I have with this feature and this path in general is that it feels so perfect for an outlander warrior that it invalidates the ranger more than the ranger does. Bear: You get resistance to all damage while you are raising (except psychic). Someone drops a fireball on you? Half damage. Get poisoned? Half damage. Dragon breathes lightning on you? Half damage. The single greatest tanking ability, not only in this entire book, but in any tabletop RPG period, and it comes online at 3rd level. Man up and be a bear. Eagle: Don't get me wrong, mobility is nice. But again, you are a barbarian. 9 times out of 10, you're going to be getting hit anyway, and if you took Bear, you'd be taking half damage from those OAs even if they were magic or silver weapons, so it's just not that great an ability comparatively speaking. Wolf: Reckless Attack for everybody! Seriously, advantage on all attack rolls (and more importantly negative disadvantage on all attack rolls) for your allies is beyond amazing. Of course, this is melee only, so if you're the only melee character in the party, this becomes red, but even just one rogue or paladin in the group brings it back up to black. (The skyblue rating is assuming you have 2 other melee characters in the party, which is the most common time you'd take it). Bear: Your carrying capacity is doubled, when you already have 20 Strength. You gain advantage on some Strength checks, which rage already gives you. Admittedly, this lets you get that advantage without having to burn a daily use of rage, which is what keeps it from being red, but still. There are better options. Eagle: You can see up to a mile away from you at all times, and dim light doesn't give you disadvantage on Perception checks. These are both hilariously good scouting abilities. Wolf: Seriously, did someone at WotC just say "you know what, to hell with it, let's just make barbarians the new rangers"? I'm not entirely sure if you retain this ability while you are using your beast sense ritual (that's probably an ask your DM question) but if you do, then this becomes sky blue. Spirit Walker: So flavorful. I personally love commune spells, as they give me insight into the DM's lore and mindset, and the idea of a talking bear showing up out of nowhere to tell me things that a ranger would have to roll skill checks for is great. Bear: This has to compete with Retaliation, and it does. If Path of the Berserker is the best damage dealer, Bear Totem Warrior is the best tank. This is similar a 3.5 crusader's ability, except it's disadvantage so it's way better. Eagle: You can fly in short bursts while you rage. Essentially this equates to "I will jump into the air to hit that flying enemy, then land on the ground so if it wants me, it has to come get me!" Not as useful as a regular flight speed, but it fixes the problems melee has with flying enemies, which is good enough. Wolf: You can use your bonus action to knock Large or smaller creatures prone when you hit them with a melee attack while you rage. There's no save, which is nice, but it's still nothing compared to the other two. Last edited by NeoSeraphi; 2014-12-24 at 07:04 PM. Strength: Literally half of the class features in a barbarian have to do with Strength. You want at least a 16 in this at level 1, but this is a stat that you should shoot to have 20 as soon as possible. Dexterity: If you're not going to wear armor, you should try to have this up a little, as your tertiary stat. Dex saves are common, but you get advantage on them anyway. Put at least a 12 in here and move on. If you're a Dex-based barbarian, this is sky blue and you want to replace your Str with it. Constitution: Rage no longer gives you hit points, so get that Con as high as possible. At least a 14 in here, preferably higher. Intelligence: Wizards were too strong in 3.5. Let's nerf them by making Int the worst stat in the game! Seriously, for every class except wizard, bard, and arcane trickster/knowledge cleric/eldritch knight should have a "Please put your 8s here" sign in front of Int. Wisdom: Other than Perception and Survival, and Wisdom saves, you're not going to use this at all. That said, Perception does come up pretty often. A 10 would be nice, but if you roll 2 8s, you roll 2 8s. Charisma: Since there's a line in the skill section that specifically calls out using your muscles to intimidate can replace Charisma with Strength, you should dump this as well. But hey, the DC for your Intimidating Presence is Charisma-based (though if you're a Path of the Berserker, you're also basically immune to charm, which makes Charisma even worse for you). I'd personally throw a 10 here. The original barbarian. Note his orcish features. I swear, orcs better be in the next book. Dwarves: You get a bonus to Con, darkvision, advantage on saves against poison and resistance to poison damage. A very good race. Hill Dwarf: You get +1 Wis, which is meh, but you get more HP per level, on top of +2 Con. Really strong. Mountain Dwarf: +2 Str, along with everything else a dwarf gets. Mountain Dwarf is one of the two best barbarian races, period. Don't listen to anyone who talks about variant humans, a barbarian needs Strength much more than he needs feats. Elves: You get +2 Dex (meh), Darkvision, proficiency in Perception (which is great) and advantage on saves against charm/immunity to sleep. Plus you get that weird elf trance ability, so you can stay up for four hours watching everyone else in the group sleep like a creep. If you want to play a Dex barbarian, this is blue. High Elf: Okay, elf is already a meh choice, but high elf gives you NOTHING that you want. +1 Int, proficiency with weapons you already have proficiency with, a cantrip based on a dump stat and an extra language. The least manly choice of all the races. Wood Elf: +1 Wis, redundant weapon training, faster move speed and more pretending to be a ranger. If you wanted to be a ranger and decided to be a totem warrior barbarian instead, this is the race for you. A Dex-based barbarian would prefer this race. Drow: Well, at least it's not high elf. +1 Cha, Superior Darkvision, Disadvantage on attack rolls in sunlight, some SLAs and some proficiencies. The orange rating is assuming you will be in the Underdark. If you're not, then this becomes red because disadvantage on all attack rolls cancels out your best class feature, Reckless Attack. Halflings: Oh man, Lucky is just too damned good. Plus, even if you have disadvantage on all heavy weapons, greatclubs are two-handed and not heavy, and they only lose an average of 2 damage from the greataxe. Advantage on saves against being frightened is icing on the cake there. Lightfoot Halflings: Charisma bonus is mildly useful, but hiding behind others is not manly at all. Stout Halflings: +1 Con, advantage on saves against poison, resistance to poison damage. Beautiful. The only thing that keeps this from being sky blue is the disadvantage with heavy weapons. Human/Variant Human: +1 to all stats is meh. +1 to Str and Con and a feat is slightly better, but it's not as awesome as it would be for other classes who have fewer ability scores they'd like to maximize. Variant human is an inherent risk for barbarians, and it involves a trade off between early offense and early defense. Abilities like Reckless Endurance and racial resistances keep your character alive to the mid level, as well as a higher Con bonus. Feats are much more offensively based, so getting one early would be good in certain situations (particularly if you are starting the game at a higher level where you don't need to worry about the early game). That said, barbarians really don't need more than one or two feats, and the sheer number of racial features you give up for a single proficiency and feat is a little underwhelming. Dragonborn: +2 Str, +1 Cha, a breath weapon and resistance to an energy type. The save for your breath weapon is Con-based. It's an interesting idea, and I'd certainly like to see it happen. You also know how to speak Draconic, which is a nice feature all on its own. Gnome: +2 Int, small size, advantage on saves against mental magic. Really nothing special here. Forest Gnome: Bonus to Dex, illusions at will and speaking with animals, which barbarians get as a ritual. Yawn. Rock Gnome: +1 Con (the only reason this is purple) and expertise on some History checks, which you aren't proficient with. The Tinker ability is awesome, but it's not for barbarians. Half-Elf: +2 Cha, and +1 to Str/Con, along with advantage on saves against charm, immunity to sleep, darkvision and 2 skill proficiencies. It's not the best option, but it's a lot better than most. This is for anyone who wants to be a 'pretty' barbarian (aka not a dwarf or a half-orc). Half-Orc: +2 Str, +1 Con. Darkvision, proficiency with Intimidate, improved crits that stack with Brutal Critical and a free daily use of Relentless Rage. Hilariously, all of a half-orc's racial abilities are just light versions of barbarian abilities, that stack with those abilities. So of course, the half-orc is by far one of the best choices for a barbarian in the game. It's got more abilities than a dwarf barbarian, but if you don't like the redundancy, go Mountain Dwarf instead. Tiefling: Bonuses to Int and Cha, darkvision, resistance to fire, and a few cantrips. Fire is very common, but if you want resistance to fire be a red dragonborn instead. This race is bad, but it's not small like gnomes and Charisma is more useful than Dex so it's better than elves too. Animal Handling: You can speak with animals, so this isn't really necessary, unless you're playing a 'ranger', in which case this becomes blue. Athletics: Athletics can be used for lots of cool combat tricks like shoving, grappling, tripping and climbing onto larger creatures. You get advantage with it while you rage, and with Indomitable Might you can't roll less than a 20. You won't regret proficiency with this skill. Intimidate: What the hell is the point of walking around deflecting arrows with your pecs if people don't faint in fear at the sight of you? Nature: Lore is always good. Perception: Just get proficiency in it. Seriously, don't whine. Someone has to. Might as well be you. Plus, you get full actions during the surprise round. Survival: Assuming you got one or both Intimidate and Perception from your race and background, Survival and Athletics are the skills you want after that. Feats are cool and shiny in 5E, but honestly the barbarian class is full of so much good that feats just don't improve it that much. Alert - The bonus to init checks is nice, but you already have advantage on them. And creatures gain advantage on their attack rolls against you already due to Reckless Attack. The only real bonus here is that you can't be surprised, which stacks well with your normal actions during surprise rounds, but assuming you have proficiency in Perception and your party plays smart, you won't be surprised more than once or twice a week anyway, not worth burning a feat on. Athlete: If you have an odd Strength score, go ahead and pick this up. Lots of nice little quirks to your physical activity. Actor: You're not a face. Charger: It gives damage, which is a decent use of your ASIs after you cap Str and Con, but only in situations where you couldn't reach the creature with your full move speed of 35'-45' (if you Dash + Attack instead of just move and attack you don't get your extra attack). If your DM likes putting lots of space between you and your enemies, take it. Crossbow Expert: If you want to play a Dex barbarian, getting extra attacks with your crossbow is nice. Defensive Duelist: If you're wielding a rapier and a shield, this feat works pretty well. Dual Wielder: A bonus to AC (you don't wear armor anyway), two one-handed weapons (not as good as one two-handed weapon) and you can draw two weapons with the same action. No. Dungeon Delver: Here we go. This is an actual use of a feat slot that I would consider after capping Str and Con. It increases your out of combat usefulness in a meaningful way. If you don't have someone to search for traps in the group, the person with the most hit points is designed to trigger them anyway, getting resistance to their damage makes you better at that. Durable: I'm not sure what the second part of the feat refers to, must be something I'm not seeing in the rules. It sound good though. Elemental Adept: You don't qualify. Grappler: Grappling is a classic barbarian strategy. If you want to feel more like a barbarian, take this feat. It's not terrible, but you still can only grapple up to Large sized creatures. Great Weapon Master: More damage. More attacks when you kill dudes. Good feat. Take it. Healer: If you are playing a low-magic game or just a game where no one has healing magic, you are probably the character who can stand to burn a feat the easiest on this. True men help their team. Heavily Armored: Gives you +1 Str and heavy armor. If, for some reason, you really want heavy armor, this is the way you get it. Personally, with all the ways you can reduce damage and soak it up, plus again, Reckless Attack heavily invalidating your AC, I don't see it as a great option. Especially since you also lose all your benefits of Rage while you're wearing it. Heavy Armor Master: If you take Heavily Armored, go ahead and grab this. This does not stack with Rage (Thank you Mechaviking), but it does stack with Bear Totem barbarian. So it's a very specific combination and still eats up 2 feats to essentially give you slightly higher AC and DR 3. Inspiring Leader: Once per long rest, you can spend ten minutes giving your team up to 25 temporary hit points. It's nice. But it's not that nice. Keen Mind: Int is a dump stat. Lightly Armored: You already have this. Linguist: If you want the cipher feature, get someone else to take this. Lucky: Why is this a thing? This is not advantage, so you can take this feat and then roll 3 attack rolls for when you really need to hit someone, or reduce the impact of the advantage against you by Reckless Attack when you really don't need to get hit. Mage Slayer: Because casting spells isn't manly at all. This lets you stop paladins from Smiting you and prevents clerics from healing when you smash their faces. Magic Initiate: Ugh. I guess this spell could technically give you decent options for when face-smashing isn't enough, like an attack cantrip. Martial Adept: Battlemasters are cool. And an extra d6 to throw onto your attack/damage rolls isn't too bad. Medium Armor Master: This is blue but only because there are some people out there who are paranoid about getting hit. If you want to play a Dex barbarian, this will give you lots of AC and help you scout better. Mobile: Interesting feat. Makes you super fast. Not a good or bad option. Moderately Armored: You have this. Mounted Combatant: Free advantage on your attack rolls, period. You can tank for your mount, which you are awesome at doing. If you are a mounted barbarian, take this feat and become the scariest guy on a horse in the world. Observant: If you are dead set on increasing your Int or Wis with a feat, this is the feat to take. +5 bonus to passive Perception checks is pretty good. Polearm Master: This feat allows you to get a similar benefit to Frenzy (though with much lower base damage) without the risk of Exhaustion. If you're going Path of the Berserker and you expect to Frenzy a lot, this feat becomes black. Resilient: +1 to a score. Proficiency in that score's saving throws. Works particularly well with Dex for Danger Sense. Ritual Caster: It's a good feat, it gives you lots of out of combat utility, but it's completely dependent on the DM, which prevents it from being sky blue. Savage Attacker: This feat is much better for barbarians than it is for fighters, seeing as barbarians only get two attacks instead of four, and a d12 can be very varied in its roll. Sentinel: Combine this with Totem Warrior barbarian and make life hell for the guy who tries to hit your rogue instead of you. Give the rogue free advantage on attack rolls against him, impose disadvantage on the guy who attacks the rogue, and then spend a reaction to punch him in the face when he does attack the rogue. Sharpshooter: If you are a Dex-based archer barbarian, this feat is as blue for you as GWM is for melee barbs. Shield Master: This feat lets you shove as a bonus action. Unless you're in a Frenzy, you don't have many options for using your bonus action, and rage gives you advantage on Athletics checks. It actually turns a shield into a very offensive strategy for a barbarian. Skilled: More out of combat usefulness. Skulker: Eagle barbarians get the last feature for free, and Stealth isn't on your skill list. The part about missing with ranged weapons is kind of nice, but if you miss with your attack roll, you're screwed either way because you blew your surprise. Spell Sniper: You don't qualify. Tavern Brawler: It's a decent option, but not nearly as good as Great Weapon Master. Tough: If you have to ask why this feat is awesome on barbarians, you clearly haven't read the title of this thread. War Caster: You don't qualify. Weapon Master: You already have proficiency with all weapons. Last edited by NeoSeraphi; 2014-12-28 at 09:49 PM. While dragonborn has nice resistances and decent strength upgrades, you should definitely select Zombie. Zombies may have a putrid odor and a ridiculously high dexterity penalty, but this is Dark Souls and Dragons so you don't care about non-strength stats. What you will get is Undead Fortitude, a racial ability that allows you to make a Constitution saving throw anytime you are reduced to less than 1 hp equal to 5+damage you just took. If you succeed, you survive with 1 hp. This can go a VERY LONG WAY. Okay and that's done! Let me know what you guys think! I think you are seriously undervaluing Dexterity as an ability and overvaluing strength. For example, using the standard array with your suggested abilities your strength Barbarian would wield a Greataxe, have a Str of 17 (+2 from Race), Dex 12, Con 14 for an AC of 13, a to-hit of +5 and damage of 1D12+5 (While raging). A Dex based Barb would wield a Rapier+Shield, have a Dex of 17 (+2 from Race), Con of 14 for an AC of 17, a to-hit of +5 and damage of 1D8+3. Using this resource, you can easily determine that on average, the Strength Barbarian would inflict 5.6 points of damage per turn to the Dex Barb whereas the Dex Bard would inflict 5.1 points of damage to the strength Barb. the strength Barb at level 1 has a minor advantage against the Dex Barb but that doesn't hold for long. When they get to level 8 and have enough ability score increases to bring the primary stat (Str or Dex) to 20, the Dex-based Barb really starts comparatively dominating with an average of 15.65 damage vs his strength-based counterpart's 14.35. Essentially, a Dex-based Barbarian could beat the crap out of a Str-based Barbarian with relative ease (And has the advantage of multi-classing with Rogue much easier - which is an awesome combination). So any guide that throws away the concept of a Dex-based Barbarian while reinforcing the Str-based as the only real option isn't very accurate, or at the very least it sure isn't telling the entire story. If you have 20 Str and the Dex barb has 20 Dex, then their damage should be 1d12+7 vs 1d8+5. If you can't use Reckless Attack, and you can't use the Rage Damage bonus from Rage, then how on earth could he out damage the Dex barb? Your spreadsheet doesn't answer the question. If, at level 5, I have a Str 20 barb who does 1d12+7 while raging, and a Dex 20 barb who does 1d8+5 while raging, there is no way the Dex barb is outdamaging the Str barb. Edit: Oh, you're talking about a Dex barb versus a Str barb. I don't care about that. Why would two barbarians fight each other? I'm going off the assumption that you're fighting, you know, monsters. Like you would at a table. In that case, Dex doesn't help you do either of your jobs (tanking or DPS) better than a Str barb does. Last edited by NeoSeraphi; 2014-12-24 at 12:43 AM. Also heavy armor mastery wont stack with rage since rage requires you to be wearing anything other than heavy armor(woe is me, I wanted a heavy armor barbarian). That is unless you go Bearbarian in which case you sack the bonus damage and advantage on str checks for damage resistance, but still this is taking two feats to be a ****tier fighter(imo). Also you subtract 3 first then reduce by half meaning its only half as effective a feat(1.5 vs 3). However, it's always nice to have another guide, especially on these forums (much prettier and more accessible). I'll go post in the Guides thread to add this guide to it. Dang, I didn't see that line of text. Teach me to skim. I'll update the Guide, thanks for your help. Yeah they will be fighting Monsters instead of each other in actual gameplay but having them fight each other is the only way to compare whether the trade of AC for damage is worth it in going Strength or Dex. The comparison tells us that trading that AC for more damage isn't worth it. Basically if tankiness means nothing at all to you, then go ahead and go strength based but if you want are willing to sacrifice a little offense for a lot of defense, then go Dex based and be an overall more powerful character. An overall more powerful character when you're just taking half damage from everything? The damage I take based on what I fight is how I determine how powerful I am. If I'm dealing 30 damage and taking 15 regularly, then I'm doing fine. Your comparison assumes the barbarian is fighting a creature that resists his damage. That's not going to happen as often as the barbarian will resist the enemy's damage (which is always). Reckless Attack only works with strength-based attacks. A dex-based barbarian is thus going to be hitting less often in addition to doing lower base damage. No I didn't even take damage resistance into account. I'll come up with another example which might help you better (This time I will even take the resistance into account if that makes you feel better). Against the Strength-based Barb, the Werewolf inflicts an average of 4.45 damage per round, taking 18 rounds to kill him. The Strength-based Barb inflicts an average of 23.8 per round to the Werewolf, so in those 18 rounds he will inflict an average of 428.4 damage before dropping. Against the Dexterity-based Barb, the Werewolf inflicts an average of 2.35 damage per round, taking 33 rounds to kill him. The Dexterity-based Barb inflicts an average of 16.6 per round to the Werewolf, so in those 33 rounds he will inflict an average of 547.8 damage before dropping. Against enemies that are no threat, the difference doesn't really matter - both will finish their enemy without taking too much damage (Although the Dex-based guy will take less damage before killing his enemy than the Str-based guy) but against an actual challenging encounter, the Dex guy is more useful. The Dex guy survives longer and in doing so inflicts more damage than his strength-based counterpart. Against the Strength-based Barb, the Werewolf inflicts an average of 6.3675 damage per round, taking 13 rounds to kill him. The Strength-based Barb inflicts an average of 28.05 per round to the Werewolf, so in those 13 rounds he will inflict an average of 364.65 damage before dropping. Basically, a Strength-based Barb is not only weaker than the Dexterity-based Barb by using that ability but he is also considerably weaker than a Strength-based Barb that isn't using that ability. It is rubbish. Last edited by Giant2005; 2014-12-24 at 02:24 AM. Yep, and at that point you're just playing a Monk without Martial Arts or Flurry of Blows, with more hp and a shield. You're making several wrong assumptions about the two Barbarians here. The STR Barbarian, knowing he has low DEX, is going to equip the best medium armor he can find appropriate for his level, which in this case means he has a Breastplate, giving him 16 AC. The Werewolf also has 12 AC and should be hit 85% of the time by a Barbarian not using Reckless Attack, or 97.75% of the time if he does attack recklessly (stats taken from this site). You've also given the Dex Barb a shield and neglected to assume that a STR Barbarian would consider using a shield and a one-handed weapon. If equipped with a shield, the STR Barbarian has 18 AC, so he has traded 1 AC for +2 to damage while raging and Reckless Attack, a very important tool that improves the STR Barb's damage per round significantly against foes with higher AC. Eventually, the DEX Barbarian can have up to 24 AC at level 20, and the STR Barbarian caps at 19 AC without feats or magic items (17 AC with no shield), but for most of their adventuring career, the STR Barb is not that far behind in terms of AC while being much more likely to hit his opponents when he needs to. As for this particular example, let's assume the STR Barb uses a two-handed weapon that does 1d12+7 damage and 16 AC. While using Recklessly Attack, he does an average of 26.4 damage per round, while taking an average of 4.53 damage per round from the Werewolf. If not using Reckless Attack, he does an average of 22.95 damage per round, while taking an average of 2.93 damage per round from the Werewolf. Meanwhile, the DEX Barb doesn't have the option of using Reckless Attack and doesn't enjoy the Rage damage bonus. He does 16.15 damage per round, while taking an average of 1.95 damage per round from the Werewolf. The Werewolf has +4 to hit bonus. It makes 2 attacks per round, dealing 6 and 7 average damage respectively. It needs a 15 to hit the DEX Barb, so its chance to hit is 30%. 30% of 13 is 3.9. Divide that by 2 gets us 1.95. That's the complete breakdown of the damage the Barbarian and Werewolf would be dealing to each other. Note that the STR Barbarian doesn't take that much more damage than the DEX one, while doling out significantly more damage on his own. I haven't even factored in the increased crit chance (9.75% compared to 5%) that the STR Barb enjoys, nor the benefits of Brutal Critical at higher levels, nor the fact that Reckless Attack allows for more effective usage of the Great Weapon Master feat. All in all, the DEX Barb gets a higher initiative, slightly higher AC for a large portion of the adventuring career and better resistance to area of effect spells. It loses the use of a strong class feature in Reckless Attack as well as the Rage damage bonus and makes poor use of the Brutal Critical class feature. The STR Barb enjoys a much higher damage potential, and fully utilizes its class abilities. Unless your campaign happens to allow the DEX Barb to pick up a Belt of Giant Strength later on, he will never deal as much damage as the STR Barb. Last edited by Pramxnim; 2014-12-24 at 02:48 AM. The gods play with dice and parchment! Your analysis does not take into account the Great Weapon Master feat (which a strength based barbarian will likely have by level 8), or the difference in accuracy from Reckless Attack. Not to mention the awesome boost from crits. And yes, there will be no difference the majority of the time. Against a powerful enemy, you may take less damage as a Dex barbarian, but you deal much more reliable damage as a Str barbarian. Reckless Attack outweighs every one of your arguments, in my opinion. If I can choose between having advantage on 36 attacks over 18 rounds and not having advantage on 66 attacks in 33 rounds, I'd rather have advantage. Additionally, advantage means more of my successful attacks will be critical strikes than the Dex barb, and my crits deal more damage anyway (an extra 1d12 over 1d6) and if we take this one level higher arbitrarily, then the damage from rage goes up by +1 and the damage disparity from crits becomes much higher (2d12 instead of 2d6). Reckless Attack outweighs every one of your arguments, in my opinion. See above - Reckless Attack isn't an ability that either type of Barbarian should be using (Unless you have some kind of rider effect that needs applied like a knockdown or something). I'm not really trying to convince you that Dexterity-based Barbarians are superior to Strength-based (Although mechanically they are), all I am trying to say is that they are far from a detrimental playstyle and your guide shouldn't be discounting them regardless of your own preferences. Last edited by Giant2005; 2014-12-24 at 02:28 AM. ...If the creature lives to attack him, yes. But there are presumably three other people helping you kill this target. In that case, Reckless Attack gains much more usefulness, because you can negate the penalty by reliably dealing your damage and having your party finish it off before its turn. Sure but if the encounter is that easy, then it doesn't really matter what kind of Barbarian you are or what class at all really. You are going to win regardless - the only variable is how much of a drain on your resources (HP) the fight will be. The Dexterity-based Barb will lose less resources in the fight than the Strength-based Barb would. If the Fight is challenging enough that the Strength-based Barb runs the risk of dying, the Dex-based Barb is not only safer but will deal more damage by out-lasting his Strength-based alternative. Dexterity does not help a barbarian's class features (other than Danger Sense). It has no bearing in common lore, it goes against a barbarian's features (Rage, Reckless Attack, Brutal Critical), so...no. I'm not going to encourage players to play a Dex-based barbarian when they could be playing Dex-based rogues or Dex-based fighters and not using half their class features. Then you are willfully letting your personal bias prevent you from outlining and giving proper merit to all of the available options. That downgrades this guide from being a "guide about Barbarians" to a guide about "how NeoSeraphi thinks Barbarians should be played". The former is obviously a more useful tool than the latter. I think the dexterity Barbarian is dang near perfect. It only has two relevant stats (dexterity and constitution) and they are going to be maxed out. The dex Barbarian can take more feats as a result of having less need to boost stats (normal barbarian need strength, con and some dex.) They are much hardier (Starting AC of 20 at level 1, ends at AC 26 without magic items) and with crossbow feats can do fair damage. A guide about barbarians should be about how to utilize your class features to your advantage, not "okay, so here is the class, now ignore all of it". Let me ask you something then. If the character gains no benefit from the Rage feature, other than resistance to damage, and doesn't gain any benefit from Reckless Attack, then what is the point of even playing the barbarian? At that point, you might as well just dip barbarian for the resistance and go fighter to pick up a Fighting Style and more ASIs/features that you can actually use. Reposting because the thread advanced quite a lot while I was typing this up. I agree with NeoSeraphi that playing a Dex-based Barb is sort of going against the grain of what a Barbarian feels like. Not that it's not a viable build, but it has its tradeoffs, and those are significant enough to not make it the obvious best choice for anyone playing a Barbarian. You also seem to have quite the bias against Reckless Attack. It is a fantastic class feature, since advantage is a very powerful thing in 5e. Your attacks will enjoy a significant boost in accuracy, and it allows you to do what most high DPR builds in 4e did, which is critfishing. The Barbarian even has a class feature built in to take advantage of Reckless Attack, Brutal Critical. How can you say the feature is useless? Dipping Fighter wouldn't be a terrible idea (I think dipping 3 levels of Champion for the expanded crit range would be smart for the Strength-Barb too) but Dex-Barbs get a fair amount out of Barb levels too. Dex Barbs get more from Unarmored Defense, Danger Sense and Feral Instinct than their Strength counterparts do and if they are ranged fighters like TVtyrant suggested, they get more out of Fast Movement too. Almost all of the other abilities benedit the Dex-based Barbarian in the same way as it does the Str-based one, they also tend to offer more than the Fighter class would (Other than a l1,2 or 3 level dip) the only class with enough synergy that I would consider dropping a lot of Barb levels for would be Rogue. These are all fair points but don't credit me with making those assumptions - those are the assumptions made by the guide and I went with it. Your alternative ideas just reinforce the fact that this guide was made with too many preconceptions about what a Barbarian should be. It isn't entirely useless, it is just inadvisable in most situations (As the math shows a few posts up). As you said, advantage is incredibly powerful - so giving it to your enemies is usually a really bad idea. It is even written in a way to maximize the penalties - all attacks against you have advantage but only your attacks during your turn have advantage (Meaning that all of the enemies attacks against you have advantage but only your attacks and bonus attack have advantage, your reactions do not). There are times where it makes sense to use but they are few and far between. It makes sense to use the ability when you have more attacks than the combined total attacks of the enemies int he encounter and when there is only one enemy and a single hit will kill him (denying him his advantage by virtue of being dead). In a standard encounter, using that ability will just have you walking away from the fight with less HP than you would if you didn't use the ability at all. Last edited by Giant2005; 2014-12-24 at 03:03 AM. Alright, then I updated the guide with some tips and alternatives for Dex-based barbarians. Additionally, because the raging barbarian takes half damage and has so many HP to begin with, attacking the Barbarian will frequently be an extremely poor tactical choice. This makes the downside to Reckless Attack function almost like a poor-man's sentinel, incentivizing enemies to attack the tank. I don't have the Werewolf stats in front of me, so I can't comment directly on your math. However, damage-inflicted-until-inevitable-defeat is a very unusual metric, and one I'm having a hard time seeing the relevance of. If your numbers are correct, then damage-per-round goes up from 23.8 to 28.05 and damage-taken-per-round goes up from 4.45 to 6.37. That's a very worthwhile tradeoff in absolute terms, and a reasonable one in proportional terms. I see no reason to assume as you do that the fight would last until the Werewolf kills the Barbarian. Last edited by kpenguin; 2014-12-24 at 03:34 AM. It is a legitimate way to play the character, and while it seems a bit odd, there's no reason to not include it as an option in the guide. These are good points and other reasons in which the ability is useful! If your enemy has advantage anyway, there is no reason not to use the ability and canceling disadvantage is more advantageous than giving yourself advantage, so if you have disadvantage, using the ability would probably be beneficial too. I don't have the Werewolf stats in front of me, so I can't comment directly on your math. However, damage-inflicted-until-inevitable-defeat is a very unusual metric, and one I'm having a hard time seeing the relevance of. It is relevant because there are two ways to end an encounter (Without fleeing or whatever) you can achieve victory or defeat. Unless you are just making throwaway characters than you don't care about, the only metric worth mentioning is which is better at not being defeated because as long as you aren't defeated, you are victorious. If the encounter is strong enough that defeat is an actual threat, then the Dex-based Barb has a better chance of victory by being able to deal more damage before his defeat condition is met. If your numbers are correct, then damage-per-round goes up from 23.8 to 28.05 and damage-taken-per-round goes up from 4.45 to 6.37. That's a very worthwhile tradeoff in absolute terms, and a reasonable one in proportional terms. I see no reason to assume as you do that the fight would last until the Werewolf kills the Barbarian. No. Just no. There is no way that anyone could consider a 17.86% increase in outgoing damage at the expense of a 43.15% increase in incoming damage a worthy trade. By increasing incoming damage by significantly more than outgoing damage, you are lowering your chances of meeting the victory condition. Good man - I'll keep quiet now . Last edited by Giant2005; 2014-12-24 at 03:14 AM.